The team is left amnesiac of the last six months in the desert with no recollection of their time together. 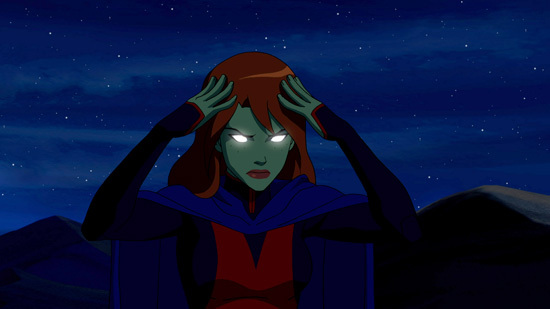 With his memories gone Superboy reverts to a killing machine only Miss martian can restore their minds and save the day! The team wakes up with no memory of each other from the past six months. This causes Superboy to revert to a mindless killing machine who endangers everyone around him. He gets captured by the army while Megan restores the memories of all her other teammates. Aqualad due to the desert exposure is dehydrated and unconscious. While the team rushes him back to the ship Megan tries to save superboy. She realizes the cause of the memory loss in the first place: the telepathic villain Psimon. They wage a telepathic war with him gaining the upper hand. despite this she restores superboys mind and together they prove too strong for psimon. By the time they meet back up as a team to depart they have the weapon which the troops were guarding and all their memories. Psimon reports back to “the light” and we learn that they received the weapon via boomtube…..they are working with Darkseid of Apocalypse!!! ← 12 year old african american makes comic!!! Young Justice Episode 1: Independence Day shows Aqualad leading!! !